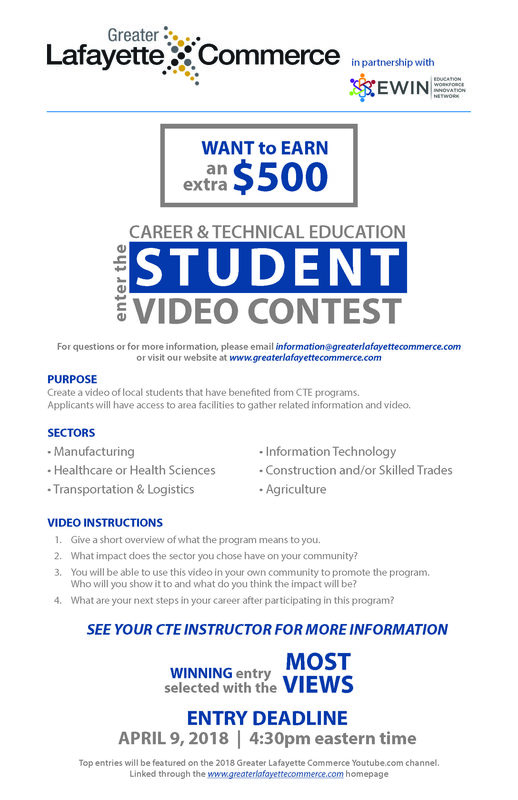 Greater Lafayette Commerce (GLC) is holding a Career and Technical Education and Work-Based Learning video contest for the purpose of highlighting the stories of students that have benefitted from these programs. This competition will be conducted in partnership and ahead of the Indiana Workforce Innovation Network’s (EWIN) Student Video Contest. Videos will be used to educate businesses, educators (K-12 and higher education), and community members across Greater Lafayette that these programs are valuable for students. Applicants will have access to area facilities to gather related information and video. Award: Winning Videos will be selected based upon the videos with the most social media likes during a Social Media Campaign from April 10th – April 12th at noon. The winning teams will receive a $500 prize that equally distributed among the participating team members to use as they desire. Winners will be announced at the Greater Lafayette Commerce Career & Technical Awards ceremony on April 12th. All videos will be featured on the Greater Lafayette Commerce Youtube Channel for the Social Media Campaign. In addition, the top entries will receive additional assistance to be submitted in the Indiana Workforce Innovation Networks Competition. How to Enter: Read the instructions carefully (download them using the button below). Each team must complete the application, an entry form for each person in the video, have a signature from a school staff sponsor, and send these materials and a link to the video to information@greaterlafayettecommerce.com. BY 4:30 P.M. EASTERN TIME ON April 9, 2018. For questions or more information, please email information@greaterlafayettecommerce.com. Eligibility and Awards: Please note, while GLC Contest eligibility is only limited to area high school students and the awards go directly to the team members, the EWIN Video contest is limited to students currently enrolled in Career and Technical Education or participating in Work-Based Learning in an Indiana high school (grades 9-12 in a public, public charter, private, or home school). EWIN Winning prizes will be given directly to the sponsoring school.